Below are my chicken grill recipes for your grilling pleasure. Once you get beyond the basics and classics of grilling like steak and burgers, chicken is a good place to start to explore. The mild, neutral flavor of most chicken lends itself beautifully to various seasoning and flavoring ideas. A couple tips on grilling chicken: Probably the biggest mistake people make with any grilled chicken recipe is over cooking. 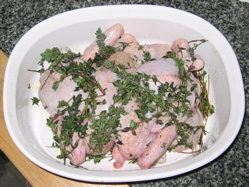 Chicken can get dried out quickly if you cook too long or too hot. The problem is, people know that you shouldn't undercook chicken because of the risk of salmonella. While this is true, you should just cook the chicken enough, not burn it to death, because it will be much more flavorful, juicy and tender. Overcooked poultry is dry and icky, don't do that to your guests! So how do you know? When is the chicken done? 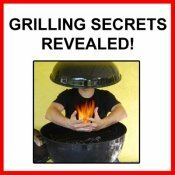 With experience you'll be able to tell by the appearance and feel of your bird as you cook these chicken grill recipes. But for beginners and intermediates, try a couple easy "cheats" to know if your chicken is done. Do Not cut the breast wide open to see if the middle is done. Besides just looking bad this releases tons of juices from the middle of the meat, further drying it out. Instead, invest in a good quality meat thermometer. Ideally, get one with a probe that can be left in the meat while it cooks. This way you have a constant reading and can take the chicken off as soon as it reaches safe temperature, no later. If you don't have the probe type of thermometer, only start testing when you think you are close to done. Each time you poke the meat you release juices, drying it out. If all else fails and you don't have a meat thermometer, poke the thickest part of the meat with a large fork. The juices that run out should be clear, not bloody or pink. Grilled Thyme Poussin - A delicious and simple barbeque grill recipe for grilling young chicken (poussin) with fresh thyme. 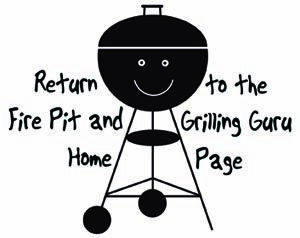 This is one of my favorite, and simplest, grilling recipes ever. Bacon Wrapped Chicken Drumsticks - What could be simpler or tastier than wrapping chicken in yummy bacon and smokin' it up to savory goodness?! My kids love these, but whether you have kids or not, I bet you can't just eat one! Tequila Lime Grilled Chicken - I recently came up with this recipe with stuff laying around the kitchen. It turned out great and has been a big success with guests! Tangy lime, smokey tequila, a hint of honey....mmmmm! Red Curry Grilled Chicken Recipe - This is a great and easy recipe that utilizes red curry paste to create a savory crust on this grilled chicken. Just a hint spicy, this turned out delicious and does not take a lot of time! It uses red curry paste, which can be found in most markets, which makes preparation easy and quick. Dutch Oven Chicken and Mushrooms - You can make a lot of things in a dutch oven in your fireplace. This is an example of a classic French dish, Chicken with Vin Jaune with Morel Mushrooms. Serve this with a white Jura wine or Sherry and prepare to be amazed. Delish! Spiced & Bacon-Wrapped Chicken Drumsticks - I really love the combination of the paprika and ginger spice with the smokey bacon. My wife simply said they are the best drumsticks she's ever had. You decide for yourself. String-Turned Roast Chicken - Here’s a recipe for cooking a chicken in your fireplace! 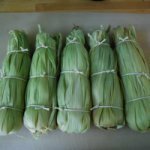 While the delicious ginger-tarragon marinade is a Provençal French classic, I experimented and came up with the best way I could find to truss and hang a chicken for string-turned fireplace cooking. This recipe even has video of the cooking process! 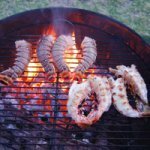 Done with the Chicken Grill Recipes page?